How active are you in the office? If you’re like most people who work in an office, or sit for extended periods of time in front of a screen for a living like myself, then you’d know that it’s easy to forget about what you’ve eaten today, how much water you had to drink and the negative impacts a sedentary lifestyle is causing your body. The best strategy I have found is to increase your awareness about how your body is feeling. Tracking your movements is a great way to see how much your body has actually done during the day. Using devices such as Fitbit and Garmin trackers are good ways to have a visual indicator to give you the harsh reality of your 8 -11 hour sitting sessions. It’s a great motivational tool when you check your tracker and realise you have only done 100 out of the 10,000 recommended steps for a healthy human. Posture is another common problem which can slowly develop if not maintained correctly. Check out this handy animation guide by Flikli to give you some helpful tips you can implement throughout your day. But let’s face it, it's near impossible to sit in the same position over the course of the day. A great little device like the Upright wearable device can remind you when your posture is out of alignment and help with your bad posture habits. Personally, the best thing I have invested in for my office set up is surprisingly not my Mac or my trusty Wacom tablet. It was my comfy desk chair. Find a chair that is recommended for 8-10 hour use. Your behind and back with thank you for it. The wrong chair can limit your performance and put you in quite a bit of pain at the end of a long day. If you want something top of the range, then go for ergonomic and with positive customer reviews. Even if you need to plead with your boss, tell them it will increase productivity and they can always claim it back on tax. Most people know the benefits of the physical exercise but can be a pain to fit into a busy schedule. If you don’t want to do it for your physical health then do it for your mental health. 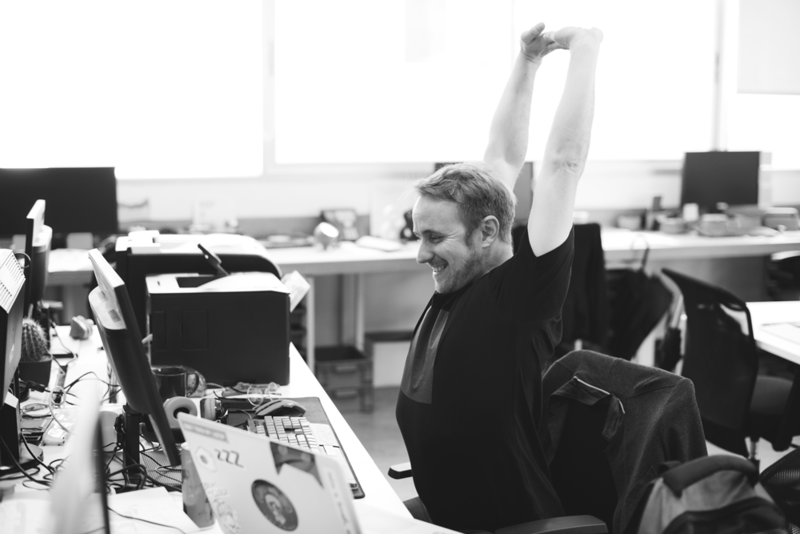 By squeezing in small intervals of physical exercise, you can improve your thinking and your productivity by increasing blood flow to the brain. All it takes is a quick walk around the block or quick gym session. I find it great to clear my head and prime my body for the challenges ahead. The hardest thing is to resist the temptation of that sugary pick me up. Our brain needs it and craves it to get you through the day. Preparing your meals the night before and bringing healthy snacks, like berries and nuts can give you that steady insulin boost to get you through the hard times. With lack of preparation, don’t be surprised when you reach for that candy bar or that sweet donut. Avoid that sugar crash and pack some healthy snacks. I find that when I am at my desk I more prone to snacking. Another thing to prep is a decent water bottle, getting the recommended 1893mls of water to keep yourself hydrated is a must. I find it stops common headaches which can come from long exposures to computer screens. Know someone the office or studio that needs to pick up their health game? Share this with them and stay sharp and healthy in your workplace.